Earned Consumption Recession. Bond Decoupling And Debt Fragility. 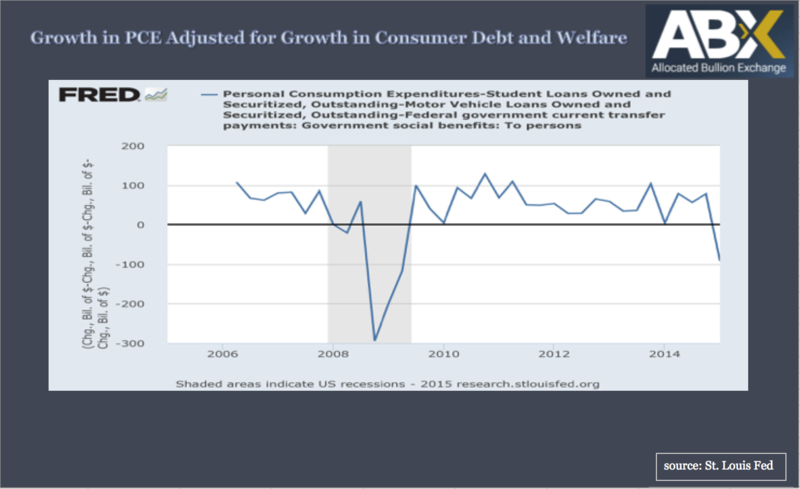 In other words without new consumer debt or personal subsidies, PCE from earned income has been very weak and is now in recession. This is arguably a better measure of economic health than GDP as it demonstrates a much less distorted view of personal consumption and its sustainability. Does this look like a strong economy that is ready for higher interest rates? Before answering that question it may be worth reviewing the other charts in the article above that show near zero CPI and falling factory orders. It is also worth a special look at Auto spending and finance as this is one of the biggest spending items. Currently, auto inventories have never been higher even though auto credit has been trending relentlessly highly. How long can they keep this up? In GDP terms auto spending is a huge plus. However, in the measure used here this is deflated by any increase in auto credit, which may provide a more valid measure. The bottom line here is that the economy is currently failing even with several layers of life support still in place. Raising rates any time soon seems to be taking an extraordinary risk with the economy. The IMF last week and the World Bank this week have weighed in on this perspective. Nevertheless bond yields are rising fast and the Federal Reserve is apparently intending to raise interest rates. The chart below shows that there is now record divergence between Fed Fund Futures and 10 year bond yields. A degree of disconnect never seen before. Already refinancing costs are rising and together with the threat of rising interest rates this should add to further caution on spending. Then there is also the matter of the risks to the broader bond markets. In 2008 it was sub-prime debt that precipitated the market implosion. Could it possibly be that similar risks remain? Howard Marks probably knows more about bond risks than anyone one else, and has written probably the best analysis on how to look at risk. This is what he just wrote in his most recent letter to investors. 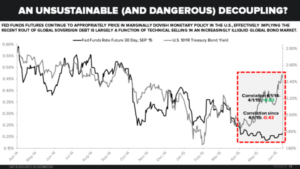 Could it possibly be that the Federal Reserve is once again leading policy towards greatly increasing risks to the already excessive bond market fragility that it has been enabling with zero interest rates ever since 2008?